The cover story of the May issue of Christianity Today features Heidi Baker, a significant leader in the "apostolic and prophetic" movement or New Apostolic Reformation (NAR), who misleads readers about her role in the movement. What is worse is that the author and editorial staff of Christianity Today failed to question the claim that Baker's only ties to the NAR are through her loyalty to leaders of the Toronto Blessing and participation in their annual Catch the Fire conference. The reality is that Heidi Baker's network in Africa is in partnership with the apostolic network of John Arnott, whose ministry hosted the Toronto Airport Revival. Baker and her husband Rolland are two of 12 apostolic leaders (six couples), including Arnott and his wife, in Revival Alliance. Baker is credited with initiating this network of apostles by Revival Alliance's Che Ahn, who is C. Peter Wagner's chosen successor as International Chancellor of the Wagner Leadership Institute. As an Iris Global missions base, our direct apostolic covering are our founders, Heidi and Rolland Baker. A 2012 Society for Pentecostal Studies conference featured a session titled "Apostle of Love: Heidi Baker (Iris Ministries) and the New Apostolic Reformation." But, according to the Christianity Today article, "the Bakers do not promote the New Apostolic Reformation or consider themselves to be modern-day apostles." The publication owes its readers an immediate apology and a retraction or correction of the article. If the editorial staff has decided to embrace the New Apostolic Reformation's radicalized ideology and its agenda for reorganizing global Protestantism, that is their choice. My allegation is not about a doctrinal or philosophical disagreement, but that the article is factually incorrect. Promoting Heidi Baker and her ministry while claiming she is not associated with the NAR is unfair and misleading to the publication's readers. "Much of this emphasis comes from the Toronto Blessing, where Heidi had her breakthrough experience. Though they have lost financial support due to their association with the Toronto movement, the Bakers are loyal to its leaders and attend their Catch the Fire conferences in North America every year. Several leaders involved are active in the so-called New Apostolic Reformation, a controversial charismatic movement. But the Bakers do not promote the New Apostolic Reformation or consider themselves to be modern-day apostles." Heidi Baker is an exemplary ambassador for promoting the movement she disavowed in the article. She has the ability to appeal to mainstream evangelicals since she is better known outside the movement for her work with African children in Mozambique. Baker's Iris Ministries is in countries including India, Sudan, Sierra Leone, Tanzania, Congo, South Sudan, Malawi, Kenya, and Israel. On page six of the eight-page Christianity Today article, the African ministry is described as "Partners in Harvest missions organization under the sponsorship of Iris." Partners in Harvest (PIH) is the apostolic network of John Arnott, and is claimed to include over 10,200 ministries. The vast majority of those are under the leadership of Iris Ministries of Heidi and Rolland Baker. The international coordinator for PIH is Dan Slade, and the African ministries are often described as PIH/Iris. The other Partners in Harvest ministries fall under Apostolic Leaders in regions of Canada, where PIH is based and the U.S., Brazil, Scandinavia, Far East, Eastern Europe, South Africa, Holland & Belgium, and Germany. "Overseers are appointed in each district of Malawi to provide leadership and accountability to area pastors and churches." One of the ministries top leaders in Africa is Supressa Sithole, now a popular speaker at American and international apostolic and prophetic conferences and shows like Sid Roth's "It's Supernatural." Both Heidi Baker and Sithole are featured in Wagner Leadership Institute training, but the websites have recently been password protected. Heidi and Rolland Baker wrote the foreword to the 2009 book by Che Ahn When Heaven Comes Down: Experiencing God's Glory in Your Life. Ahn describes the restoration of modern-day apostles and prophets. "As I look back through the history of revival, I see that every wave of God's outpouring is important because, in each revival, He restores something. In fact, over the past half-century, we see that in each movement God restored an office within the five-fold ministry, including apostles, prophets, evangelists, pastors, and teachers. ...In the 'Third Wave' of the 1980s, God brought forth prophets, as John Wimber introduced the 'Kansas City prophets' Paul Cain, Mike Bickle, Bob Jones, James Goll, and Jill Austin. Other prophets emerged during that period, including my friend and covenant brother Lou Engle, my sister in the Lord Cindy Jacobs, Jane Hamon and Chuck Pierce. The 1994 revival in Toronto restored the office of the apostle with the birth of many apostolic networks, including John and Carol Arnott's Partners in Harvest, Rick Joyner's MorningStar, Bill Johnson's Global Legacy, Heidi and Rolland Baker's Iris Ministries and our church's own Harvest International Ministry. Now, in 2009, we see the convergence of all five of these restored offices coming together and being expressed through the Body of Christ in His followers the saints." Note that in the context of the apostolic and prophetic, it is believed that supernatural manifestations can be passed from person to person through impartation. For example, Randy Clark is credited with sparking the Toronto Blessing in 1994 by bringing "holy laughter" from a Tulsa revival with Rodney Howard Browne to John Arnott's Toronto Airport Vineyard Ministry. Arnott's church was later kicked out of the Vineyard network because of the unusual manifestations of the multi-year revival, including rolling in the floor, barking, and roaring. In a 2012 bulletin, Che Ahn describes Revival Alliance as in development prior to 2008. "In 2005, Bob Jones prophesied to Heidi and Rolland Baker to form a new network that would be the container for the one billions souls coming in. He named John and Carol Arnott, Bill and Beni Johnson, Randy and Deanne Clark along with Sue and me among those to be involved. God also revealed Georgian and Winnie Banov's involvement as we all met together to pray and strategize. The baby was born around Easter in 2006 where we came together and formed the Revival Alliance. God lead us to map out the world and our respective areas of greatest strength at that time: The Bakers, Africa; the Arnotts, Canada and Europe; the Johnsons, Australia, New Zealand and the USA; the Banovs, Eastern Europe, and HIM in Asia and India. Since submitting ourselves to each other and God's larger mission, our HIM churches have doubled to more than 10,000 and every ministry within Revival Alliance cites the same exponential growth." The Revival Alliance leaders host conferences including the Voice of the Apostles. Heidi Baker is a featured speaker at these and other apostolic and prophetic events - "conferences" that often more closely resemble a cross between a rock concert and a tent revival. The 2012 Voice of the Apostles is scheduled for October 17 - 20 in Lancaster, Pennsylvania, and is advertising speakers Randy Clark, Bill Johnson, Heidi Baker, Rolland Baker, Georgian Banov, and John Arnott. At the core were such issues as extra-biblical doctrine, overemphasis on angelic encounters and necromancy. Christianity Today has either leapt or somehow blundered into this same controversy with the Heidi Baker article. In 2008, as Todd Bentley's Lakeland Outpouring faith-healing revival was drawing international attention, a "commissioning" ceremony was held for Bentley. The event was described by C. Peter Wagner as "apostolically aligning" Bentley with Revival Alliance's apostles who would then "commission Todd as the evangelist for the Lakeland Outpouring." It culminated in Che Ahn placing a ring on Bentley's finger to symbolize the covenant relationship. "A total of 17 apostles participated representing three apostolic streams: ICA, Revival Alliance, and Morning Star (Rick Joyner)." "Your power will increase. Your authority will increase. Your favor will increase... I also decree that a new supernatural strength will flow through this ministry. Stacey Campbell, another leading apostle/prophetess and current board member of Baker's Iris Ministries, Inc., also prophesied over Bentley as seen in the linked video. In 2003, long before Todd Bentley became the superstar of the Lakeland Revival, he partnered with the Bakers and Iris Ministries on a project in Malawi. Bentley's ministry, Fresh Fire, reported on the claimed results, including supernatural healing of HIV/AIDS and the appearance of Jesus in the crowds. In 2005 Bentley again partnered with Iris Ministries, this time in Mozambique and including Che Ahn's Harvest International Ministries. Heidi Baker is a regular speaker at Todd Bentley's "Secret Places" conferences, including one with Bob Jones held in January of 2008, prior to the beginning of the Lakeland Outpouring. She has endorsed several of Bentley's books. The following is described in Bentley's Fresh Fire Ministries (FFM) report on the 2003 Baker and Bentley Malawi project. Malawi, as well as some other African countries, is plagued with the AIDS epidemic. Although local governments are finally promoting a message of sexual abstinence in schools, the epidemic has already hit an alarming rate. Quite often, those who attend the crusades who are HIV positive are hesitant to come to prayer. Todd invited them to come unashamedly and receive forgiveness and cleansing. We were glad to report three different individuals who were tested by their doctors after receiving prayer, to be totally healed of this dreaded virus. AIDS can be beaten!" ...During the AM sessions, Heidi Baker and Todd Bentley preached messages on Philippians 2 and the anointing and favor of God. Many of the pastors in Lilongwe are discouraged as most churches are very small in size because of the horrendous witchcraft existing in the area. On the final morning, Todd and Heidi and a number of FFM staff escorted over 350 pastors, Christian leaders, and workers outside to an open field and imparted special grace over each one. The same report describes Bentley's call for people to bring him their dead. Todd Bentley has been encouraging the local people to bring the dead to the crusade meetings where opportunity will be given to see them raised up with resurrection power. On one of the days when an outreach was scheduled at a 1000 unit hospital, the opportunity did come allowing a handful of FFM access into the holding room of the hospital (morgue). Although there was no visible evidence of a `Lazarus coming forth', we know many more opportunities will be waiting in the future, and yes, the dead will be raised in Jesus name. Baker, like most New Apostolic leaders, is focused on fighting witchcraft and expelling demons, including from children. Typical of NAR narratives, Iris Ministry accounts include descriptions of burning witchcraft items, including one account complete with green smoke. New Apostolic leaders teach that in preparation for the end times, their adherents will develop increasingly powerful supernatural abilities and have the power to convert millions of people of other faiths through exhibiting "signs and wonders" or supernatural acts. At the Lakeland Revial event, where Che Ahn gave his account of the formation of Revival Alliance, he also declared Todd Bentley to have a "double portion" of the anointing of William Branham. Branham was a leader of the faith-healing revivals of the late 1940s and early 1950s that became known as the Latter Rain movement. Branham is described by Rolland Baker as the "most anointed" person on earth since Jesus. The concept of "overcomers" with great supernatural powers is rooted in the Manifest Sons of God theology of the Latter Rain movement. "We can do the same or greater things than Jesus did because we have access to the same power source." "Raising the dead is a good strategic plan! The church grows when you raise the dead." Heidi Baker not only claims to raise the dead, but also claims supernatural "multiplication" of meals, similar to Jesus multiplying the loaves and fishes. Bentley's faith-healing revival at Lakeland was controversial, even among many Charismatics and New Apostolics. Bentley served time as a juvenile for sexual assault and other crimes. The revival was also controversial for his practice of punching and kicking the ill and injured he was supposedly healing. These controversies did not end the Lakeland Outpouring, nor did ABC's Nightline investigation of Bentley or the fact that Nightline could find no evidence whatsoever that anyone had been healed of the hundreds of thousands of people who came from all over the world for the spectacle. (Nightline Part One and Part Two) Likewise, there was no evidence of Bentley's claims of the dead brought back to life. The revival came to a close only after Bentley was caught cheating on his wife. In the linked video, Bentley says that the Holy Spirit commanded him to kick an elderly woman in the face with his biker boot during a service. He also describes punching another elderly woman so hard that she flew through the air and crashed through a closed door. The Lakeland Outpouring included Bentley head butting, punching and kicking the ill and infirmed. Since the 2008 scandal over his infidelity, Bentley has been going through rehabilitation under the supervision of Rick Joyner and MorningStar, but this hasn't stopped his gloating about his violent faith-healing. Heidi Baker's participation in the apostolic and prophetic is not based on "guilt by association," as some of today's modern-day apostles claim when they want to deny they are a movement, but on extensive documentation of her significant role in the movement. Baker is one of the ten contributors (shown in graphic at right) to the 2010 book The Reformer's Pledge, along with John Arnott, Bill Johnson, Lance Wallnau, Chuck Pierce, C. Peter Wagner, Jim Goll, Cindy Jacobs, Lou Engle, Jim Garlow, and editor Che Ahn. In a previous article I described Garlow's claim that he was not familiar with the term New Apostolic Reformation and addressed reasons why it benefits the movement to avoid use of terms like NAR, "apostle," and "prophet" when appealing to mainstream evangelical audiences. Other NAR-deniers have included Samuel Rodriguez and former National Association of Evangelicals president, Ted Haggard. Heidi Baker and Lou Engle are two of the leaders providing "apostolic covering" for Burn 24-7, a youth-oriented group that participates in Lou Engle's TheCall events. Burn 24-7 is led by Sean Feucht and is similar to TheCall in focus, including teaching that homosexuality is caused by a literal demonic spirit. Baker has also participated in TheCall, co-founded by Engle and Che Ahn, including in Jerusalem. 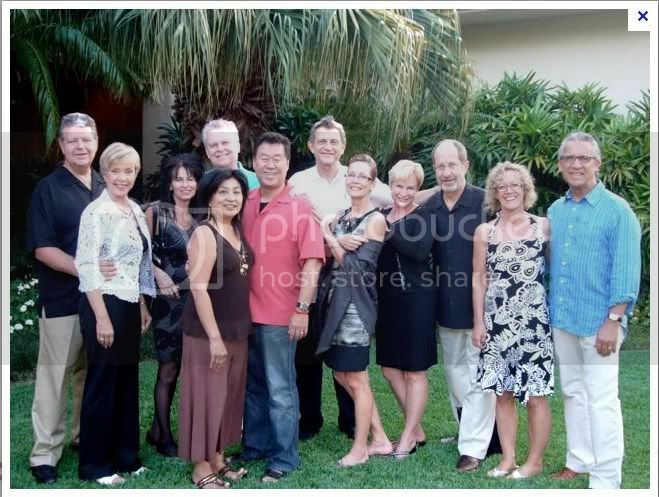 Heidi Baker and Lance Wallnau, a lead spokesperson for the "Seven Moutains Mandate" were the featured speakers just a few weeks ago at a conference hosted by the ministry of Stacey Campbell, a current member of the Iris Ministries, Inc. board, and her husband Wes. Another board member of Iris Ministries, Inc. is Kris Volloton, who leads the Bethel School of the Prophets and "has served on Bill Johnson's apostolic team for over 33 years," according to his bio. Why did Christianity Today decide to feature Heidi Baker in the May cover article, but make a point of denying her ties to the NAR? I don't know the answer, but this is not the first wide-scale promotion of Baker. She has been regularly featured in a multi-million dollar project by funded by the Templeton Foundation that has also included the promotion of C. Peter Wagner and most of the Revival Alliance apostles. In the project these New Apostolic leaders are described as "exemplars of godly love" in a "study of unselfish love for all others without exception." That might come as a surprise to those well-versed in the NAR's Dominionist agenda and attacks on those of other faiths. It's difficult to reconcile the "Flame of Godly Love" and "Institute for Research on Unlimited Love" studies with the NAR's claims that its spiritual warfare networks can supernaturally destroy the icons or buildings of those of other faiths, and maim or kill other humans through prayer. It's also difficult to reconcile with leadership's claims that others - including homosexuals, freemasons, and those of other religious faiths - are controlled by literal demonic beings. "There are credible reports that Heidi Baker heals the deaf and raises the dead..."
Apparently this uncritical acceptance of Baker's supernatural powers was referencing the study by Candy Gunther Brown, also funded by the Templeton Foundation. Michael McClymond, referred to in the article, has also been part of the "Flame of Godly Love" project funded by Templeton. The 2012 Society for Pentecostal Studies conference described earlier in this article, included a presentation on Heidi Baker's network by Margaret Poloma, also funded by Templeton. In the same session, titled Symposium on New Apostolic Networks and the Third Wave, McClymond spoke about Randy Clark's apostolic network. The Templeton-funded projects promoting apostolic and prophetic leaders will be addressed in future articles and an upcoming report by Talk2action's Bruce Wilson. 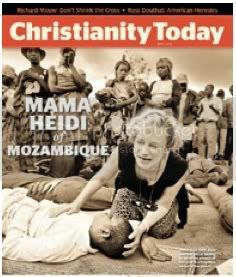 Perhaps the staff at Christianity Today was misled by the beatification of Heidi Baker in the Templeton-funded studies. Regardless, they owe their readers an apology and a retraction or correction of the article. This series has been continued in Part Two: Christianity Today Promotes NAR Prophet Heidi Baker. The cover story is a "puff piece." In this case, I feel that the Christianity Today story bears more resemblance to a PR agency product than to journalism -- which as a practice has traditionally made claims to a modicum of objectivity. Sure, "journalism" has eked out a somewhat different niche from "news", but the enterprise has typically presented itself as getting to the truth in a deeper and more compelling fashion than news stories. Christianity Today has long skirted the issue of major changes in American and world evangelicalism, and it has indeed showcased the most PR-friendly leaders within the emerging politicized charismatic movement known as the NAR, but without informing CT readership of their affiliation with the NAR, or by denying the very existence of such demonstrable ties. Earlier examples of this include CT's promotion of former ICA apostle Samuel Rodriguez (he's on the CT board) and its 2005 story, by Tim Stafford, on Jack Hayford -- who has played a big role in promoting NAR doctrine, from his well-regarded perch as a "gold standard" pentecostal leader. As Talk To Action readers are aware, we've showcased video of Hayford introducing a 1993 C. Peter Wagner lecture on Spiritual Mapping, which Hayford claimed to be a Biblical practice. For me, the issue comes down to truth-in-advertising. It would be legitimate for Christianity Today to openly run stories on leaders in the New Apostolic Reformation, because doing so would require acknowledgment that the movement is wildly controversial. But by showcasing, one by one, major leaders in the movement while at the same time neglecting to note their role in a movement that many evangelicals find scandalous does a major disservice to CT's readers. is one of the most incidious groups in this country, particularly with their attempts to unite science and religion. I am not surprised by their support of this delusional lunacy. I can tell you that his "Lakeland Revival" was actually counterproductive... emergency responders had to regularly deal with people who stopped taking their medicine because "You've been HEALED!" and suffered severe consequences (I've heard that some people died, but haven't tried to confirm that information). Emergency personnel had to be present, and it was not at all popular with them because of the problems that happened there (and they weren't all because of medical problems). Healings taking place? More like disasters. Oh, and knowing some of the people involved, I'm not surprised at all at the problems that occurred.